An issue with packagings of cardboard is the visibility of the product. With this packaging we tried many options to keep enough sight, without the tomatoes falling out. We created two openings, at the front and back, for air circulation. An advantage of tomatoes is that these fresh products have a pretty good shelf life, even without plastic. The Kumato has a dark-brown/golden-green color and an intense, sweet taste. Ripening occurs from the inside to the outside. 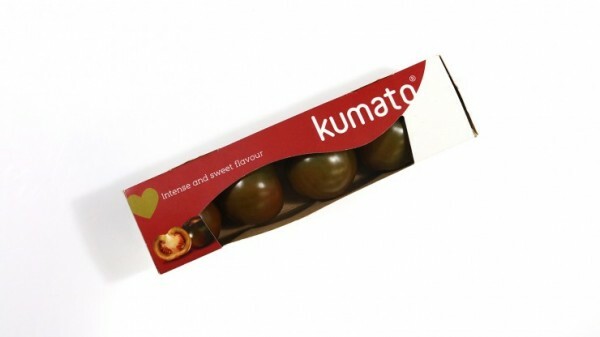 The Kumato looks suprisingly in your shelf, it is sustainable and not just a regular red tomato. You can use this tomato perfect for tomato carpaccio or a caprese salad! We created this packaging together with our supplier Den Berk. Den Berk is one of the best growers in Europe when it comes to tomatoes. Together we developed the packaging for two different markets. Therefore we have two different packagings, one with the German language and one in Dutch, German and French. Of course we can develop a packaging adjusted to your market together. The Kumato in this new packaging is available in 10x340g from Belgium from the 8th of April.